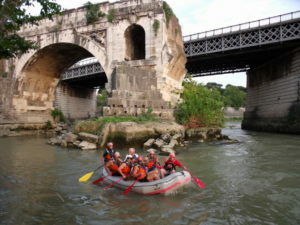 The rafting descent on the Tiber takes place entirely within the urban area of Rome. The initial briefing held by expert guides will provide all the information required to carry out the activity safely: describes the behavior in the boat, the commands, the technique of paddling, the equipment and what to do in case of a fall in water. Further explanation will then be provided directly on the boat. Boarding is at the base of the very ancient Ponte Milvio, on the right bank. Some paddling to familiarize and off to play on the rapids just downstream of the bridge! The descent continues so quiet, gliding on the water away from the traffic and noise of the city. Ancient and modern bridges following one after the other and all of a sudden, after a curve, here is the majestic St. Angelo Castle and the imposing Dome of St. Peter in the background! Another few hundred meters and you reach the Tiber Island. While the ferry takes the right branch and stops shortly after Ponte Garibaldi we take the left branch and face the rapids below Ponte Garibaldi and those under Ponte Fabricio, another ancient Roman bridge! Finally the striking passage under the single arch of Ponte Rotto leads us to the landing at the Port of Ripa Grande, on the right bank. The total duration of the route is about 2.5 hours. We are in the heart of Rome!